The purpose of a weight distribution hitch is to ensure the towing vehicle has a level and smooth ride. This means you are able to tow to the maximum weight capacity of your trailer hitch without the vehicle sagging or becoming difficult to handle. The best weight distribution hitch is the Blue Ox BXW1500 SWAYPRO, which has a 1,500 LBS tongue weight and a 15,000 LBS gross trailer weight and simply clamps onto standard couplers with no fine tuning needed as the hitch head is pre-adjusted. If your trailers weight is over 50% of your towing vehicles weight, a weight distribution hitch and sway control is recommended. When installed, you will instantly feel an improvement in steering, braking and less trailer swaying, which is fairly scary. 7.1 How Does Weight Distribution Work? 7.2 What is Sway Control? When investing into a weight distribution hitch, we highly recommend that you choose one with sway control. Reducing trailer sway will make you more relaxed whilst towing as when your trailer is swaying, it can be scary and dangerous. There are two weight ratings that you must understand before purchasing a weight distribution system. These are Gross Trailer Weight (GTW) and Tongue Weight (TW). GTW is basically the gross weight of the trailer and its load, whereas TW is the weight of the trailer and cargo that is behind the rear axle of your towing vehicle. If you are regularly towing, then you really should invest into one of these systems. Below is a list of the best weight distribution hitches that include sway control and simply clamp on to most standard couplers. The Blue OX SWAYPRO is a premium weight distribution hitch, which includes a top of the range sway control system and is compatible with most electric trailer brake controllers. The BXW1500 includes a pre-adjusted hitch head and it will simply clamp on to most standard couplers. In terms of the Blue Ox BXW1500 SWAYPRO weight ratings, it has a gross trailer weight of 15,000 LBS and tongue weight of 1,500 LBS. As the name of this weight distribution hitch suggests, there has been plenty of development gone into the sway control. This is thanks to chain-link adjustable torsion bars and excellent design, which makes trailer sway non existent. Another benefit is that the chains do not need to be removed when backing up, which is a desirable trait as it can be frustrating having to remove these chains. Compared against the alternatives, the Blue Ox BXW1500 SWAYPRO is expensive but it is definitely worth paying extra. It is the best weight distribution hitch you can buy with excellent sway control and weight ratings. The Equal-i-zer is another premium example of a weight distribution hitch and like the Blue Ox BXW1500 SWAYPRO, it focuses heavily on sway control. It uses a 4 point sway control system that provides the highest resistance to trailer sway. There is also one option that includes two 5/16 inch hitch balls along with the 1,000/ 10,000 LBS configuration. Regardless of your weight rating configuration, all use two solid steel bars mounted directly on the metal brackets for a sturdy setup. Compared with the Blue Ox, which is at a very similar price bracket, it does lack the weight rating but the Equal-i-zer makes up with for it with the impressive sway control. Overall, it is one the best weight distribution hitches with sway control, with the Equal-i-zer’s impressive 4 point system being the main selling point. Sway control is a major feature and this system is by far the best within this article. The majority of people will not be able to stretch their budget to the price of the two alternatives above. However, this is where the Eaz-Lift comes in as it is the most cost effective alternative. It includes a distribution hitch, sway control, hitch ball and everything else you need to install the system onto your towing vehicle. You are able to configure this weight distribution hitch to match your requirements with different tongue weights. There is a choice of 600, 800, 1,000 and 1,200 LBS but we always recommend the largest rating to be on the safe side. The maximum gross weight rating is 12,000 LBS, which is fairly good considering the low cost of this system. When it comes to installation of the Eaz-Lift Camco Elite Hitch Kit, there is no messing around with fine tuning certain components. This is because the hitch ball and sway control ball is already pre-installed and torqued to perfection. Overall, it is the best weight distribution hitch for the money. Unlike many of the cheaper alternatives, it is not made from cheap materials and for this reason and the value for money aspect, it is one of the most popular systems. The Husky 32218 is a popular choice of many towing vehicle owners as it combines weight distribution and sway control into a single unit. It has a gross trailer weight rating of 12,000 LBS and tongue weight capacity of 1,200 LBS. It is a mid-ranged product compared with the alternatives but features a forged and hardened steel and is a heavy duty weight distribution hitch. In terms of the installation, the hitch ball is factory installed and torqued to the correct setting. The hardware such as universal EZ adjust frame bracket also make the installation and adjustments more straight forward too. Thanks to the design and hardware such as lift brackets, head and spring bars, the ride is quiet, smooth and highly responsive. Yes, it is more expensive than the Eaz-Lift Camco Elite Hitch Kit but you are paying for the build quality and design features, which will improve your towing experience. The Anderson weight distribution hitch uses chains to attach to the brackets instead of solid bars, which makes it much more lightweight. Anderson Hitches claim that the MFG3350 is the quietest weight distribution hitch on the market thanks to the materials and lightweight construction. For those worried about the bouncing effect when towing, this kit uses a “true motion” dampening system for a huge reduction. Limited noise and low levels of bounce ensure that the ride is as smooth and comfortable as possible. Although it is lightweight, it can still provide large weight ratings. The gross trailer weight is 14,000 LBS and the tongue weight is 1,400 LBS, which is excellent in terms of the performance. Overall, the Andersen MFG 3350 is the quietest weight distribution hitch you can buy and offers excellent weight capacities that can deal with a range of trailer loads. It is slightly on the more expensive side but its a worthwhile investment if you require a less bouncy and quieter towing experience on the road. If you are towing heavy trailers with big loads or large caravans, a weight distribution hitch should be used. This is because it will provide a smoother ride that wont suffer from trailer sway, bad steering or poor stopping abilities. It is advised that if your trailers weight is over 50% of your towing vehicles weight, you should use a weight distribution system. When you are towing a trailer, the tongue weight is transferred to the rear axle of your towing vehicle, which will result in the rear sagging and the front raising. This will cause performance issues with the car and it will not act as it would normally. Steering, braking, traction and other issues will become apparent and for long journeys, it can be very tiresome and dangerous. We have put together a buying guide that goes through everything you need to know regarding weight distribution hitches and sway controls below. How Does Weight Distribution Work? Some vehicles may have a hydraulic or air rear suspension, which can level the rear of the car. This is a great feature but if you have a trailer that is over 50% of the weight of the tow car, it is still highly recommended. Not only for performance purposes but also to take some of the slack of your cars rear suspension as most hydraulic or air suspension system can be very expensive to repair. All the recommendations above are a weight distribution hitch with sway control built in, which means there is no need to install it separately. 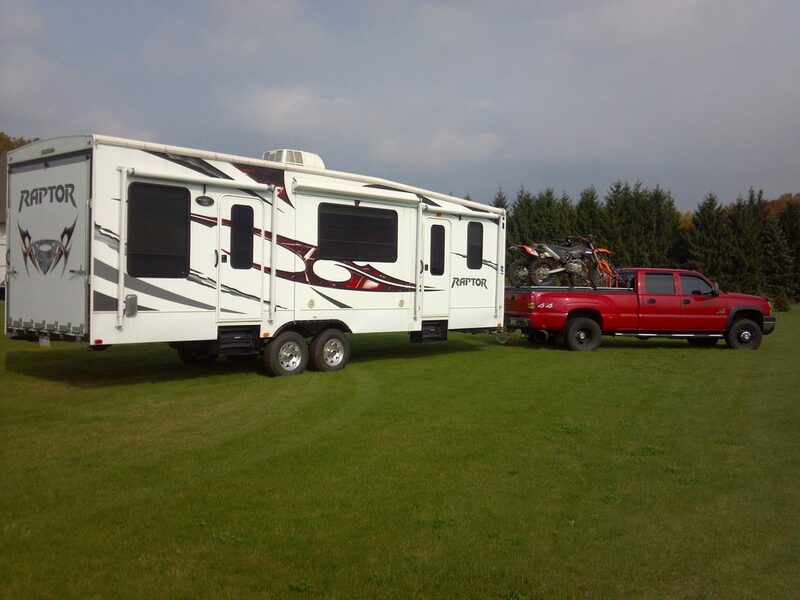 Trailer sway is not fun and a bad experience of it can put you off towing for good. If sway control is the number one priority, we highly recommend the Equal-i-zer as it has the best sway control with a 4 point system. The swing bars are a major component of any weight distribution kit and without them, it would be impossible to leverage the weight. There are however two types of swing bars, which include rounded swing bars and trunnion swing bars. The benefit of rounded swing bars are that they are easier to install, setup and also provide much more clearance. However, the trunnion swing bar alternative will provide a much higher weight rating, which is a big requirement for many. In the table at the beginning of this article, you will notice that each weight distribution hitch has a tongue weight and gross trailer weight rating. Usually, the tongue weight is around 10 to 15% of the gross trailer weight. The gross trailer weight (GTW) is the easiest to define and is quite simply the total weight of the trailer that includes the load on the trailer too. Tongue weight (TW) is the weight that behind the axle of the towing vehicle and too much of this weight causes the towing vehicle to sag. Too little tongue weight makes the trailer more prone to swaying and jack knifing. Finding the perfect GTW or TW is dependent upon what you intend on loading upon your trailer. However, a weight distribution hitch with sway control is the answer to conquering all these dangerous scenarios and will ensure you have a smooth ride. If the GTW of the distribution systems are too little for what you intend to be towing, then there is an alternative. A 5th wheel hitch can be used to tow trailers as heavy as 25,000 LBS but it will require a truck to be able to install such a hitch. Towing anything on the open road needs to be done with great caution. Upgrading from a standard trailer hitch to a weight distribution hitch system is highly recommended for heavy loads. Trailer sway is a worrying thought regardless of your towing experience because at any moment during the sway, you may lose control of your vehicle. Along with purchasing a weight distribution hitch, you should also be looking at sway control systems. All of the hitches in this article have them built-in but many do not, so if you do not go with one of the above, be sure to read the full specification. Once you have your weight distribution hitch installed, remember to use a trailer hitch lock to secure the load and you ensure it has been tuned properly. Many come with pre-installed hitches that require no fine tuning.